A bill that increases the power of the federal Food and Drug Administration to regulate tobacco products cleared the Senate on Thursday. WASHINGTON (CNN) – A bill that increases the power of the federal Food and Drug Administration to regulate tobacco products cleared the Senate on Thursday. The Senate voted 79-17 for the measure, which is similar to a bill already passed by the House of Representatives. An aide to House Majority Leader Steny Hoyer of Maryland said the chamber will vote Friday on accepting the Senate bill, which would send the measure to President Barack Obama for his signature. tradition, the two senators from Virginia - another tobacco state - supported the measure, indicating a moderate shift in the state's politics. The tobacco bill would allow the FDA to ban some tobacco products, limit the amount of nicotine in tobacco products and enlarge warning labels. A White House statement quoted Obama as calling the measure historic for "giving the scientists and medical experts at the FDA the power to take sensible steps that will reduce tobacco's harmful effects and prevent tobacco companies from marketing their products to children." The statement said Obama looks forward to signing the bill. so we live in country that lives on the idea of freedom but enforces restrictions on what people can do, what people can say, and resitrictions on people's bodies. People with allergic reactions, EVERYTHING WILL AFFECT YOUR ALLERGIES! From grass pollen, air poolutants, cologne, perfurm! Yes smoking is bad fo you. So are so many other things. Drinking from plastic bottles are shown to kill you these days. Seriously! Why is it okay for someone else to decided what the behavior should be for someone else? And don't give the whole "i'll end up paying for your hospital bill!" Dude you are paying money for people who morbidly obese, crack addicts, and the such. Is booze, beer, and wine next??? They cause health and addiction problems as well. One question: Why are all the conservatives here mentioning Obama? This was passed by the Senate; whether or not Obama is president is irrelevant to the passage of bill in the Senate. Here's why the real reason Republicans are against the tobacco bill. Republican government, the best money can buy. Senate Minority Leader Kentucky Republican Mitch McConnell received $419,025 from the tobacco industry, more than any other member of Congress. North Carolina Republican Sen. Richard Burr , who led the opposition to the bill, $359,100 from the tobacco lobby. Donations from the industry overwhelmingly favor Republicans, according to the Center for Responsive Politics. Yup, those Republicans are one principled bunch. The principle being lining their pockets and profiting from the misery of others as we've seen with the tobacco bill and, coming soon, the health care bill. 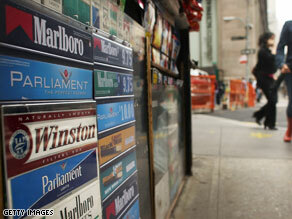 Cigarettes should cost $20 a pack to cover the cost of rising health care. It's poison.